Grant Associates. Owner. Was a service business working with attorneys located on LaSalle Street in downtown Chicago for seven years. Ages from 5 to 9 years. We are so blessed with these wonderful children! My retirement is full of travel, spending time with my grandchildren and winters in Arizona. Our class was the first class to attend Hay Branch on Laramie for our freshman year. We occupied the top floor of a grammar school, and there were four divisions with about 120 students. I believe this is why our class was so close as we were the cool kids at Hay as we were the high schoolers. I probably had a crush a week until Sophomore year when I went steady with my crush Jeff Vetter until senior year when I dated John McIntyre, a younger boy. Always had a crush on a boy in my division but always stayed friends. I wish I could remember his name. Short beady eyed teacher that came to Austinmaybe in Junior Year. Reminded me of Dracula. Athletic Committee was my favorite committee. Activity nights were great fun. Baseball and football games. The friends I made who are still in my life. My least favorite memory is the day of the riot in the lunch room that spilled over into the halls. Student Council was great. I had French lessons in 7th and 8th grade. We went to the children's symphony monthly in 8th grade. Gale Arden and I were going to give a speech to the parents attending Nobel's Open House but we somehow got in trouble with a substitute teacher who couldn't take a little joke, and we were banned. That was a horrible thing to happen to an eighth grader. Hosted a CAN (Cable Access Network) Chicago Local TV program 2005-2008. Appeared on some news programs while working at homeless agency in 2004-2008. Judith Grant McIntyre has a birthday today. Judith Grant McIntyre added a comment on Profile. Judith Grant McIntyre posted a message. New comment added. Happy Birthday Mr. Corsiglia. Where did the years go? Hope the next year is a great one. 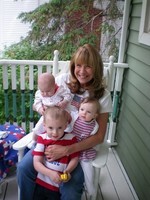 Judith Grant McIntyre updated profile. View.